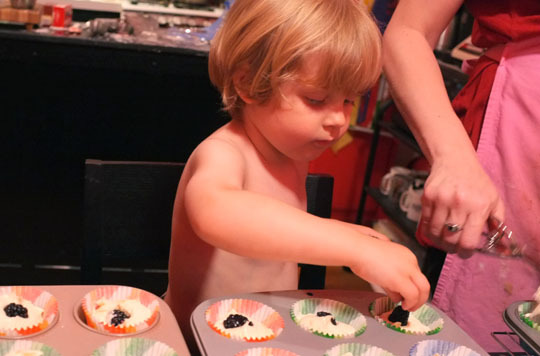 “What flavor of cupcakes do you want for your birthday party?” my friend asked her almost-three-year-old son. How about some blackberries? 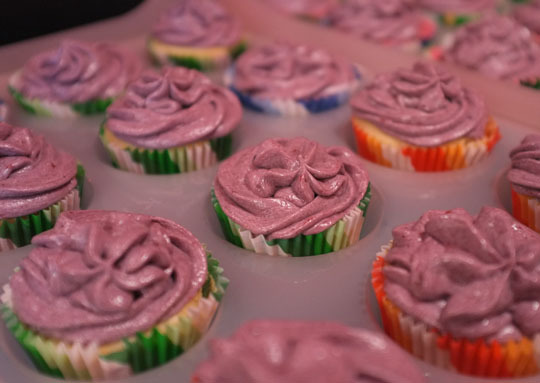 Last year, I made this berry-loving child chocolate cupcakes with icing made of butter, cream cheese, powdered sugar, and mixed berry preserves. I had chosen to use preserves after hearing about problems fresh berries can cause. We’ll get back to that later. Lemon cupcakes sounded good for summer, and lemons and blackberries are a tasty pairing. 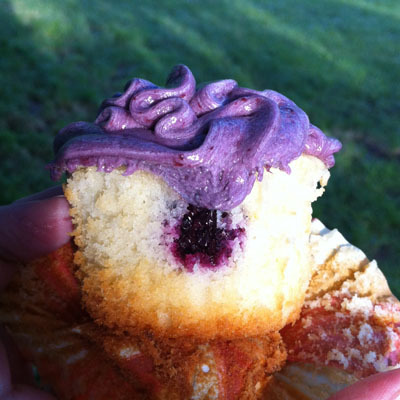 I went with a favorite lemon cupcake (like these but with lemon) and made buttercream icing with fresh blackberry puree. The fresh, bright flavors were lovely together, if I do say so myself! This year, the birthday boy helped! 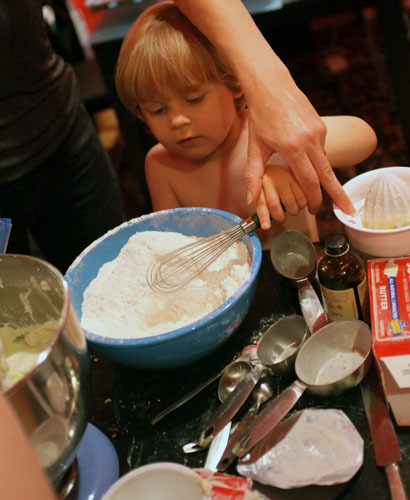 He and his mother help me set up by putting the paper liners in, juicing lemons, and sifting the dry ingredients. Once the lemony goodness was mixed up, he carefully dropped exactly one blackberry into each cup as I scooped in the batter. Each cupcake had a little surprise inside. I had a problem getting the consistency right for the icing. I pulverized the blackberries in my blender, then strained the resulting purée to remove the seeds. I added butter, powdered sugar, purée, powdered sugar, butter, butter… It was goo, impossible to pipe. I think the fresh berry purée was just too much liquid, but I (thought I) needed all of it to get the flavor I wanted. I refrigerated the icing overnight, then tried again, adding butter and sugar until it was workable. The natural color from the blackberries was a pinky-purple, so I cheated a little bit, adding some blue food coloring to bring it to this purple. 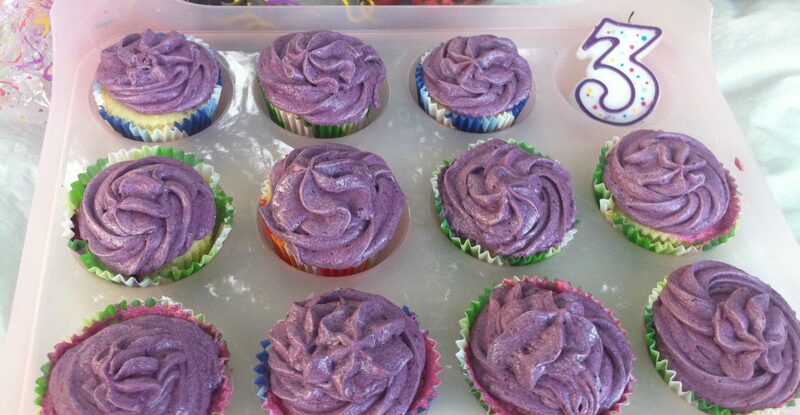 I finally got the icing made and piped on, the cupcakes packed up and off to the park for the party. 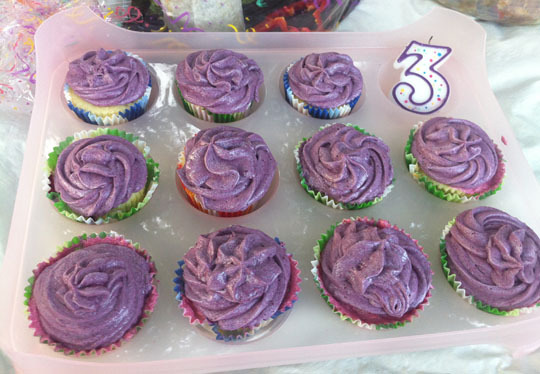 The birthday boy got his purple cupcakes.